If I cast my mind back many years, to when I was a little girl, I have very clear memories of the brown Milton sterilising unit sitting on the kitchen counter presumably for my little brother’s baby items. Not surprising given Milton has been a leading name in sterilising for over 65 years. Of course as the years have passed more modern sterilising methods have come about, not least microwave and steam sterlising. As a Mum myself I learnt pretty quickly how important sterilising is. A baby’s immune system is not as fully developed as ours and germs that older children and adults can deal with can be dangerous for small babies resulting in gastric issues and thrush for example. One of the big challenges as a parent of a baby is keeping baby’s items; bottles, teats, soothers, breast pumps or whatever it might be, sterilised while on the move. Even if you have invested in a big fancy steriliser in your home it is not practical to have to cart it everywhere you travel. I soon realised how easy it was to just pop a packet of Milton sterilising tablets in my suitcase and be able to fill up a sink of cold water and throw in a Milton tablet to sort out the baby equipment. The Milton ‘Mini’ Portable Soother Steriliser; a totally unique and original method to safely sterilise soothers in and out of the home (winner of Loved By Parents 2015 and Mother & Baby 2016); the Solo Travel Steriliser and the Combi Microwave and Cold Water Steriliser both of which can be used with its iconic Sterilising Tablets (Mumii Best Baby and Toddler Gear Awards for 2015) or award-winning Sterilising Fluid (Mumii Best Baby and Toddler Gear Awards for 2015). There is also the Milton hygienic range including Antibacterial Surface Wipes, Antibacterial Surface Spray and Antibacterial Hand Gel to help parents keep their baby’s environment germ-free. Milton have offered me two of these great products to giveaway to one of my lucky readers. On offer is the Mini Portable Soother Steriliser and The Solo Travel Steriliser both outlined with their blurb below. The Milton Mini Portable Soother Steriliser has been designed to deal with that everyday mum dilemma – how to safely clean a dropped soother. 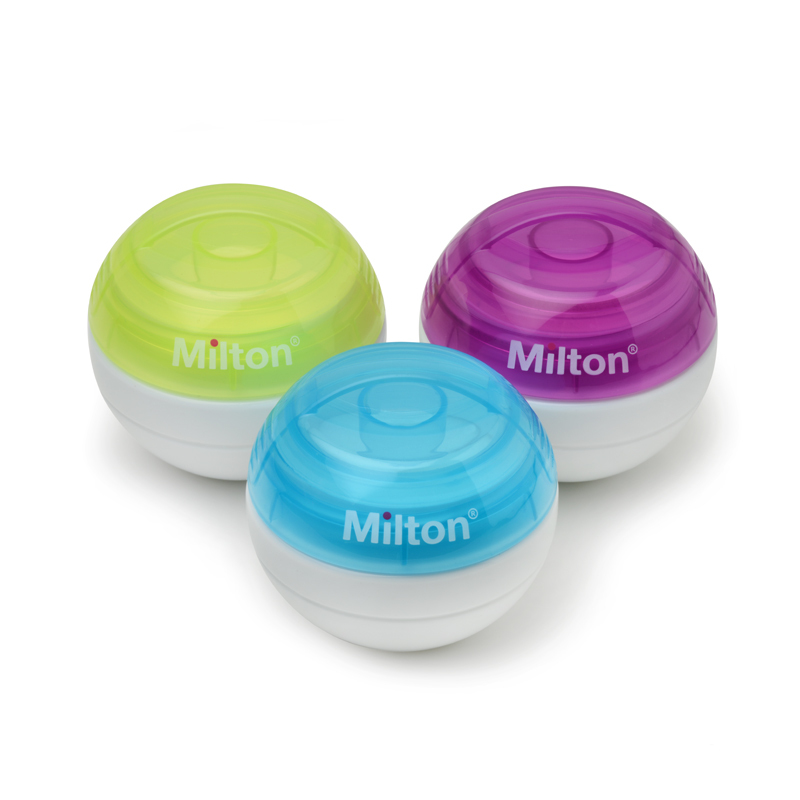 BPA-free, small and watertight, the Milton Mini Soother Steriliser has been created to sterilise soothers on-the- go and can be popped into a changing bag. The new improved design includes a more tactile attachment strap, a wider base opening for larger soothers, and advanced water bottle closure technology (instead of a silicone rim) for easier cleaning. The Mini uses the tried and trusted Milton Method to sterilise soothers; simply add cold water and a Mini Sterilising Tablet and the Mini will kill bacteria and viruses in just 15 minutes. A soother will remain sterile for 24 hours in the solution so you can always have a clean one to hand. Remember there is no need to rinse! The Milton method leaves no taste or odour and it is SAFE to use the soother immediately. The Milton Mini is available in three vibrant colours – blue, green and purple. It is stylish, lightweight and watertight, making it the safe home for a child’s soother. The Milton Solo Travel Steriliser is 2-in- 1 microwave or cold water steriliser, ideal for sterilising when travelling or away from home. It cleans and sterilises bottles, teethers, plastic toys, breastfeeding equipment and other small baby equipment from 2 minutes in the microwave and in 15 minutes for cold water. A portable, lightweight, practical way to sterilise – whether at home, a day trip out, overnight stay or away holiday! Its unique ‘lay flat’ design fits in most microwaves. The patented vent technology means the Solo retains more heat for better sterilisation, automatically releasing excess steam gently and safely. To enter, use the Rafflecopter form below. You can enter using the various methods on the entry form and the winner will be announced after the closing date of 13th February 2017. Entries are open to Ireland and UK residents only. Winner will be asked to provide a postal address. See full T&C’s on Rafflecopter form. Disclaimer: I was provided with the prize by Milton however was otherwise not paid to write this post. While some of the competiton is hosted on Facebook, it is not associated in anyway with Facebook. Next articleAnd the winner of the Milton giveaway is…….